Do you have a tiny entry and no closet? Or a closet that is woefully inadequate for your things? Here are a few ideas to help you maximize your storage potential! Did you know that a closet organizer can double or triple the storage space of a closet? Finding the right configuration is the key to success. 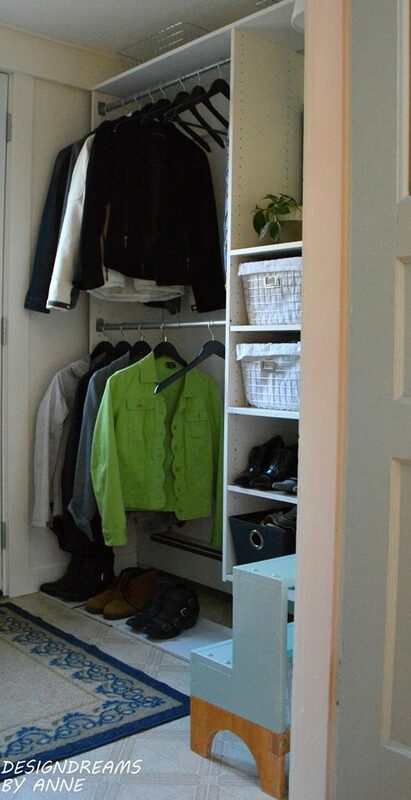 The best closet organizers are easy to assemble and switch around as your needs or the seasons change. You can double your hanging space and add shelves or drawers for things that can’t be hung up. Closet organizers range in price from $50 to $500 depending on finishes and styles. If a true closet organizer is out of your price range, substitute inexpensive tall bookcases. Keep the top shelf in place and add hooks or closet rods instead of the middle shelves, just be sure to hang the closet rods flush with the front edge of the bookcase to allow for hangers to be hung without banging the back of the bookcase.